The Weather Guy: Spring Forward! 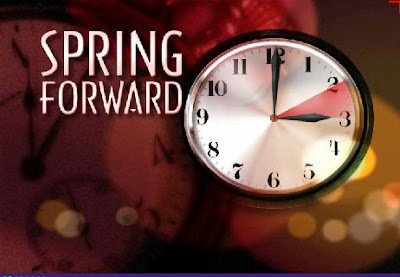 We 'spring forward' tonight at 2:00 a.m. Since I will NOT be staying up that late (did in my 'old' life), I will be setting the clocks ahead at bedtime. Speaking of spring, can you believe our high touched 70° from 3:09 pm to 4:19 pm! Very nice. Rain is moving in for our Sunday. Appears to be more likely in the evening. We've gone from 15° to 70° in only 5 days. Chance of some 'exciting' weather in the next few days. Thunderstorms, some briefly strong, may appear on Tuesday. Our good friends over at News 2 in Nashville say we might see some frozen stuff by late next week...nothing like that to knock us back into the reality of winter! The good folks over at NewsChannel 5 in Nashville are offering a Severe Weather Safety Book via .pdf file . The graphics on it are excellent. Go to their site to download it...or click here for the Safety Book. The other thing they offer...and I really like this idea is called 'Weather Call '...it does cost $9.95 a year, but can be customized for your area. VERY NICE PRODUCT!